Podcast Boss. Creative Impostor. Purveyor of Urban Meditation Experiences. Authentic Voice Whisperer. Facilitator of Brave Space for Creative Women. Andrea Klunder collaborates with creative entrepreneurs, artists and holistic practitioners in an integrated approach for cultivating a sustainable creative work and lifestyle. In 2017, she launched Season 1 of Power Your Story, a podcast made for students by students at a high school for students with diverse learning challenges in Chicago. She is a a Meditation & Mindfulness facilitator for startup companies & creative individuals and the Founder of Peace & Play Yoga for kids and grownups. Andrea’s classes and workshops integrate her background in music, theatre and creativity to engage students in a playful experience of peaceful practices. Andrea facilitates the Chicago Women’s Creative Collective, a community for women who make things: art, books, blogs, podcasts, theatre, films, websites, businesses, food and any other creative endeavor you can imagine! And she created Podcast Envy and The Creative Impostor Studios to to help other creative visionaries use the power of podcasting as a tool for connection, storytelling and being seen via your authentic voice. 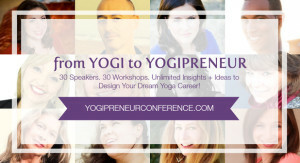 Andrea has been a featured speaker and trainer for The Yogipreneur, CRAVE, Soul Love Fest, About Women, and the Women in Travel Summit and has been featured on many podcasts! Most importantly, Andrea loves singing kirtan (musical meditation) as much as humanly possible. I believe that nothing in life is an accident. I believe everything happens as a result of your actions, your choices, your karma. I believe that your karma is linked to everyone else’s and that we have a collective responsibility to live in such a way that builds ourselves up, builds each other up and holds our entire global community up to the light that glows within us. I believe in living a life of limitless abundance. I believe in living a life of ferocious passion. I believe in living a life of endless devotion. I believe in living a life of fearless authenticity. I believe you have a choice about what you put in and on you body and mind. I believe you have a choice about how you spend each moment and each dollar. I believe you have a choice about who you surround yourself with daily. I believe that every choice matters and that you can tap into an infinite source of wisdom, love, and energy to help guide you in making the best possible choices in this one precious life. I believe in living life on purpose. And so here is my offering to you. Topics range from mindful business strategies to creative process to music & sound healing to personal empowerment to yoga & meditation. To inquire about availability for your event, training, podcast, blog or conference, please contact me directly with details!